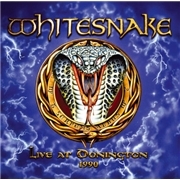 DAVID COVERDALE´S WHITESNAKE, further introduction is probably superfluous but here I go (again). After leaving DEEP PURPLE mark IV David decided to move while the irons´s still hot and started a solo band The White Snake Band. Before releasing “Trouble” as WHITESNAKE the young band first displayed themselves with an EP called “Snakebite”. Some line-up changes later the glory years was soon to come with bluesy albums like “Trouble”, “Lovehunter”, Ready ´an Willing”, “Come ´an Get It” and “Saints and Sinners”. Up until then the classic line up of David, guitarists Micky Moody (SNAFU etc) and Bernie Marsden, bass legend Neil Murray, plus former DEEP PURPLE compatriots Jon Lord, keyboards and Ian Paice, drums. 1983 signaled changes with “Slide It in”, as Tom Galley, guitars, Colin Hodgkinson, bass, and soon ex THIN LIZZY and TYGERS OF PAN TANG guitarist John Sykes made up the numbers. Soon Jon Lord also left to reform DEEP PURPLE and Richard Bailey replaced him. In 1987 David returned with a new band, reinventing his creation as a hair metal band. As all musicians were fired eventually the new line-up consisted of well-travelled personnel; guitarists Adrian Vandenberg and Steve Vai (! ), bass man Rudy Sarzo and drummer Tommy Aldridge. This is where this story takes place, ladies and gentlemen, welcome to Donnington!